China's capital, Beijing, has long been one of the world's largest urban areas. Some reports placed its population at over 1 million in 1800, which would have made Beijing the largest urban area in the world at that time. Later in the nineteenth century, Beijing dropped below 1 million population, as London, Paris and later New York rose to prominence. 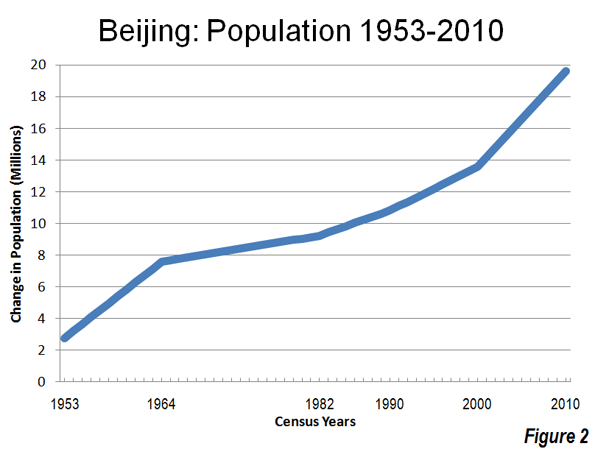 As late as 1953, Beijing had a population of fewer than 3 million. Since then the city’s population has increased more than six times (Figure 1). Beijing is one of China's four "directly administered municipalities" or "provincial level municipalities," along with Shanghai, Chongqing and Tianjin (Note 1). 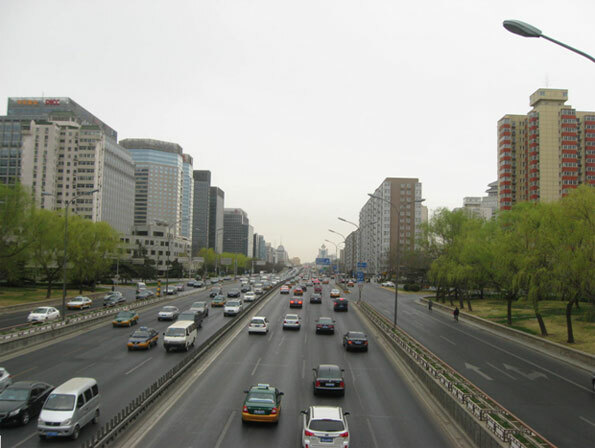 Moreover, like Shanghai and Tianjin, Beijing is essentially a metropolitan area, composed of an urban area and exurbs approximating a labor market. This is unlike Chongqing, which has extensive rural areas and extends far beyond any plausible definition of a metropolitan area (having the land area approximately the size of Indiana or Austria). The Growing Beijing Urban Area: In the 1990s, Beijing added 2,700,000 people and had a population of 13.6 million in 2000. Between 2000 and 2010, Beijing population increased by more than double the previous increase, or an increase of 6 million people. The Expanding Beijing Urban Area: Based upon the most recent census, the next edition of Demographia World Urban Areas will estimate an urban area (urban footprint) population of 17 million, with an urban land area of 1,350 square miles (3,500 square kilometers) and an urban density of 12,600 per square mile (4,900 per square kilometer) in 2011. Beijing ranks as the world's 12th largest urban area and is larger than any urban area in the United States or Europe with the exception of New York. As in other urban areas of China, there is considerable undeveloped land in enclaves within the suburban areas, which could develop further, raising both the population and the density. Falling Urban Densities: Even so, Beijing is far less dense than before. Deng and Huang at the State University of New York, Albany, place the 1949 urban land area at less than 25 square miles (63 square kilometers. Based upon its early 1950s population of less than 3,000,000, the population density of the entire urban area could have been more than 100,000 per square mile or 40,000 per square kilometer (precise urban population is not available). This is greater than the highest density major urban area today, Dhaka (Bangladesh) at 90,000 per square mile or 35,000 per square kilometer. Today's urban Beijing may have an overall population density one-eighth that of the 1950s. This illustrates a reality often missed by urban analysts, who confuse population growth with increases in population density. In fact, as the Evolving Urban Form series (Note 2) indicates, dispersion is at least as important in the expansion of megacities as population growth itself. Population densities generally decline as urban areas add residents. At the same time, Beijing's expansive suburbs do not resemble the low-density suburbanization of Phoenix, Portland, Perth or Paris. Much of the development is in high rise condominiums and a substantial part is lower quality, lower rise development that houses Beijing's large and growing migrant population (referred to as the "floating population"), most of whom do not have Beijing resident (hukou) status. Even so, there is no shortage of detached luxury housing (called "villas") in western style developments. such as "Orange County." 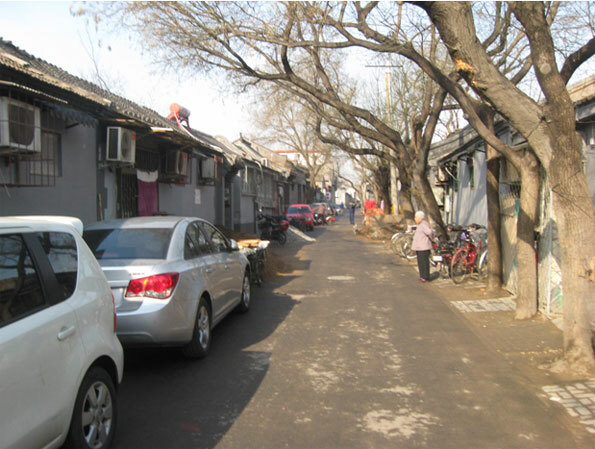 More recently there is increasing demand for a more modern version of the "siheyuan" (courtyard) housing makes up the renown "hutong" areas of Beijing and other Chinese cities. One website refers to the "siheyuan" as the Chinese version of the "American Dream" and a recent China Daily commentary even suggested that this type of housing should constitute the future expansion of Beijing. However, a quick review of real estate offerings for the new siheyuans, makes it clear that they are simply unaffordable for a growing middle class that finds it difficult to afford new flats in high rises outside the 4th ring road. A map of Beijing's districts can be seen here, with color coding that corresponds to the geographical divisions in the table. 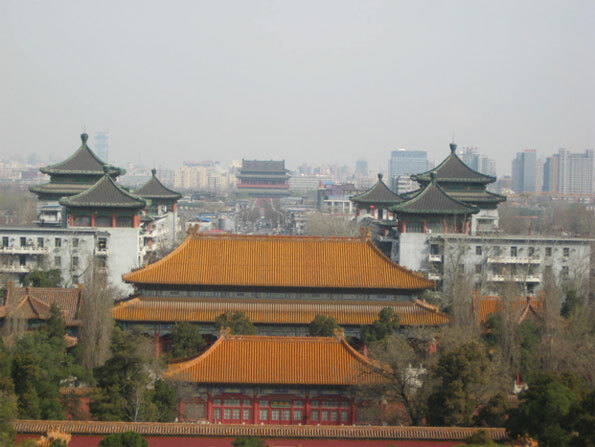 The Inner City: During the last census period, less than one percent of the population growth has been in the inner city, which consists of the districts of Xicheng and Dongcheng, largely inside the 2nd ring road and contains the Forbidden City, Tiananmen Square, the Drum Tower (see photo below) and Bell Tower, and the Yonghegong Lama Temple (Buddhist). These districts, which contain nearly all of the remaining hutong (see photo above) residences grew only 2.2 percent. At 61,000 people per square mile (23,500 people per square kilometer), inner Beijing approaches the population density of Manhattan or the Ville de Paris. Outside the Inner City: More than 99 percent of Beijing's growth was outside the inner city. The first and second ring suburbs accounted for 96 percent of the growth, while the outer areas accounted for three percent of the growth. 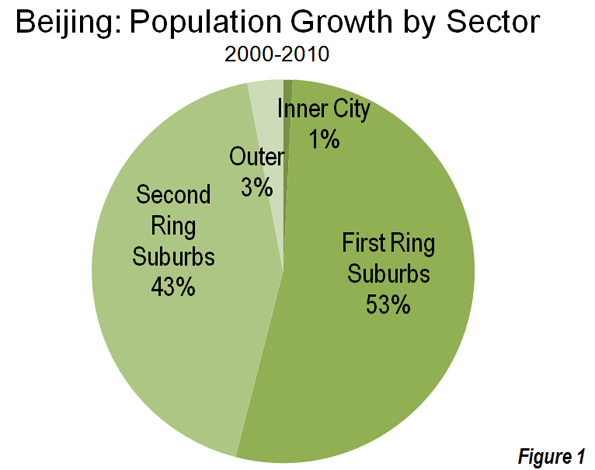 First Ring Suburbs: The four inner suburban districts of Beijing captured 52 percent of the provincial growth between 2000 and 2000. Overall, the four suburban districts added 3.2 million people, a nearly 50 percent increase in population. The population density in the inner suburbs was 19,400 per square mile in 2010 (7,500 per square kilometer). This is a higher density than the city of San Francisco. The inner suburban districts are generally located within the 5th ring road. The first ring suburbs include the district of Chaoyang, which has the largest population and where at least one-half of the population generally lack Beijing residency (hukou). Chaoyang is also home to the new Beijing "central business district," (CBD) which is the largest concentration of high rise towers in the urban area includes the controversial architectural icon, the CCTV Headquarters (photo at the top). The development of the CBD in the inner ring suburbs and other major commercial development are indicative of a dispersion of employment that, if permitted to continue, could ease Beijing's legendary traffic congestion. Second Ring Suburbs: The outer suburban districts accounted for 44 percent of the provincial population increase between 2000 and 2000 and 2010. However, the outer suburban districts had the highest growth rate, at 72 percent, The outer suburban districts are generally located outside the 5th ring road and include considerable rural territory. The population density is 2100 per square mile (800 per square kilometer). Beijing Capital International Airport is located in this area, though it is under the jurisdiction of the inner ring district of Chaoyang. This airport is now the world's second busiest in passenger volume, following Atlanta and having passed perennial runner-up O'Hare International in Chicago. At current growth rates Beijing Capital International could become the world’s busiest airport within five years. Outer Areas: The outer areas are largely rural and well outside the urban area. Nonetheless, the growth rate in the outer areas was well above the national rate and six times the rate of the inner city. The outer areas gained 186,000 people, approximately four times the inner city gain. Future Challenges: The floating population Beijing (and Shanghai) represented most of the population growth from 2000 to 2010. More than 7 million of Beijing's nearly 20,000,000 population are migrant workers. Government officials have expressed concern at the rate of population growth and have indicated an interest in severely limiting future population growth. 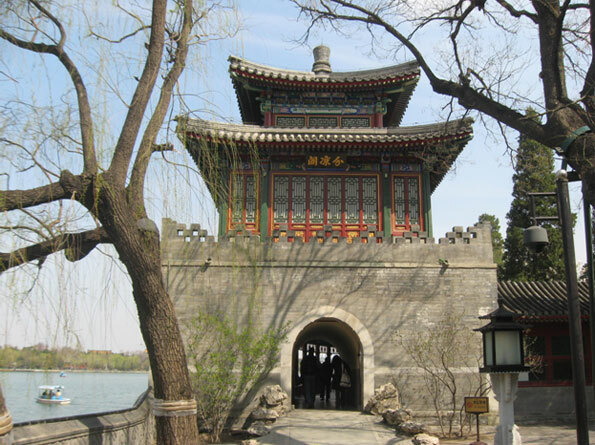 Among Beijing's considerable challenges is providing sufficient water for its large population. Beijing lacks the plentiful supply of water that is available to many urban areas of central and southern China (example, Shanghai, Nanjing, Wuhan and Chongqing) and the government is building a system to divert water especially from the Yangtze River. The 2020 census results could reveal a significant slowdown in growth, if these problems are not sufficiently addressed. Note 1: What are translated as "cities" in China are not cities as understood in the West. A "shi" in China (translated as "city") is actually a region that may approximate a metropolitan area or labor market area in the West (with an urban core and a much larger surrounding rural territory). Some "shis" are much larger, however, such as Chongqing, which covers a land area similar to that that of Austria and nearly as large as Indiana. Chongqing and many other "cities" are far larger than any plausible metropolitan area definition. "Shi" may exist either at the provincial level (as in the case of Beijing, Chongqing, Shanghai and Tianjin) or it may exist within a provincial level jurisdiction, such as Nanjing in Jiangsu. Guangzhou in Guangdong or Wuhan in Hubei. Every square mile of a province (excepting the provincial level jurisdictions) is divided into shis, prefectures or comparable units, in the same way that US states are divided into county level jurisdictions or the regions of France are divided into departments. To complicate matters more, shis themselves may have county (xian) level shis within their borders, such as Cixi, a county level shi with approximately 1,000,000 people within the Ningbo shi in Zhejiang province. Note 2: Other megacities reviewed in this series have been: Jakarta, Los Angeles, Manila, Mexico City, Mumbai, New York ,Seoul and Shanghai . 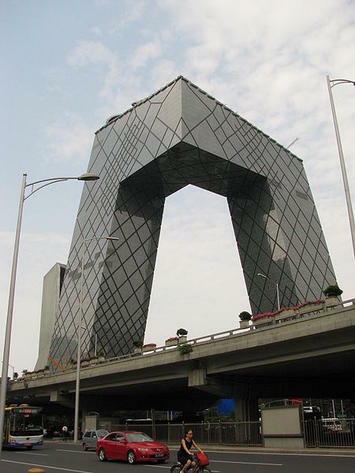 Photo: CCTV Headquarters in new Beijing CBD, Chaoyang district. Photo by Iamdavidtheking. Submitted by xahgzr1122 on Mon, 03/23/2015 - 06:17. Submitted by xahgzr1122 on Thu, 03/19/2015 - 06:58. Submitted by xijozx1122 on Wed, 03/18/2015 - 09:39. Submitted by xijozx1122 on Wed, 03/18/2015 - 04:59. Submitted by xahgzr1122 on Mon, 03/16/2015 - 06:14. Submitted by xahgzr1122 on Sun, 03/15/2015 - 06:19. Submitted by xijozx1122 on Sat, 03/14/2015 - 06:49. Submitted by xijozx1122 on Sat, 03/14/2015 - 05:08. Submitted by xijozx1122 on Wed, 03/11/2015 - 10:18. Submitted by xijozx1122 on Tue, 03/10/2015 - 05:37.